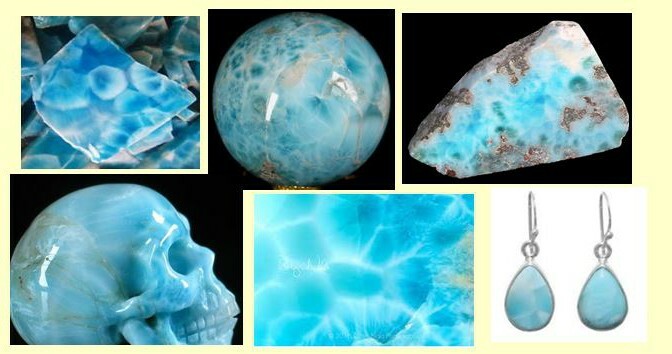 Larimar is actually a varietal form of the mineral pectolite, a sodium calcium silicate mineral found in some syenites, and within cavities in basalts and diabases. Pure pectolite is white/gray and generally unworthy of lapidary attention. However, the pectolite found in vugs within the volcanic rocks of the Bahoruco Mountains of coastal Dominican Republic contains small amounts of copper replacing the calcium in the mineral lattice. This copper imparts a unique and attractive blue color and the presence of healed fractures in the otherwise massive mineral adds an appealing texture to a polished surface. Larimar has a modest hardness, 4.5-5 on the Moh’s scale. Not hard enough to be a valuable gem in jewelry, but certainly hard enough for standard cabochon work. And what color! It seems that the same healed fractures that give the mineral its appeal also provide weak points that can fail at the most inopportune time when working with the stone. 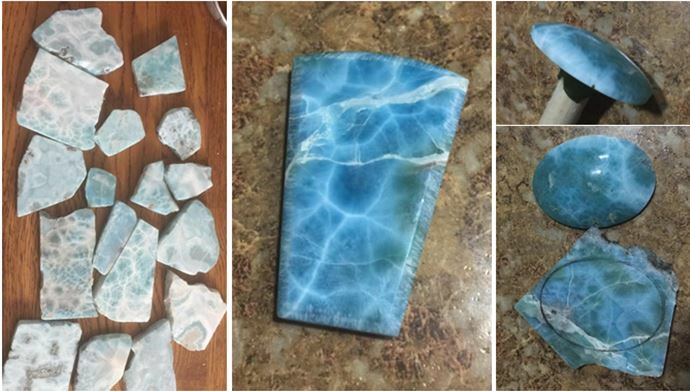 If you subscribe to Rock & Gem you can learn a bit about the history of larimar, and more importantly read Kaniuth’s suggestions on how to best work with larimar. If you do not receive Rock & Gem and are interested, perhaps you should subscribe! 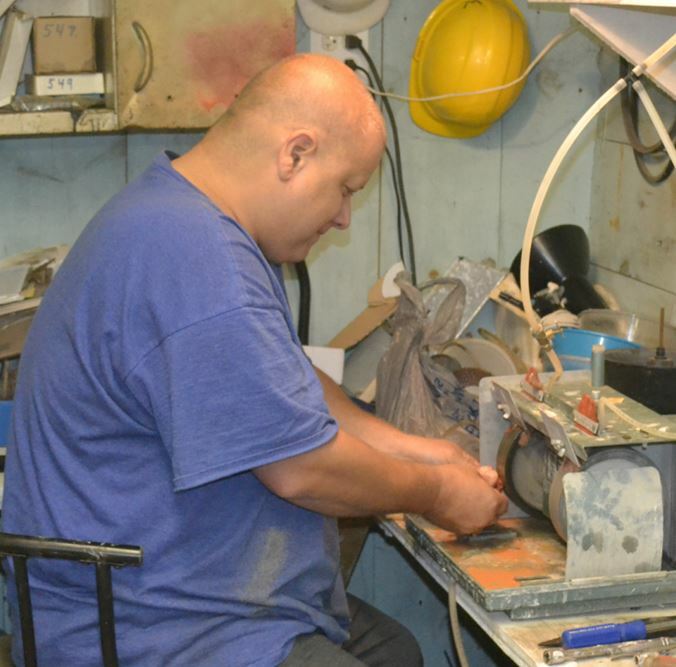 Robert Webster at work on one of the grinding wheels at the WCGMC workshop in December. How does one join the WCGMC group? I am highly interested in learning more and perhaps going on some expeditions with the group this year. Sorry, I do not check the comments here very often. 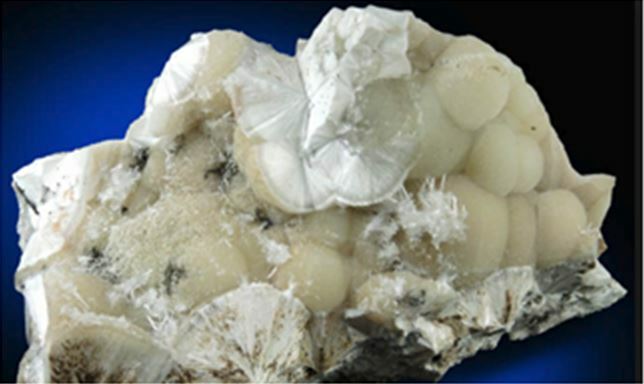 You can learn about the Wayne County Gem and Mineral Club in western NY by visiting the website (www.wcgmc.org). There is info there on membership. Best thing to do at this time would be to come meet us at our annula show June 3-4 in Canandaigua. the website has all the info on that. Once a member you can join any trip you would like.